Some remember it as the Crooked Billet, others the Cook and Fillet and many as the place where movie star Kate Winslet had her wedding reception. But in its new guise as the Akeman Inn this popular pub-restaurant has rediscovered its soul. Aylesbury’s restaurant scene is becoming a bit mundane and let’s be honest it is not particularly awash with fine dining establishments. Therefore many of us will happily venture that bit further around the Vale in search of a special night out and a decent meal. Just pulling into the car park anyone who has been to the previous incarnations of this gem tucked away off the Bicester Road between Westcott and Grendon Underwood will see instantly the vast improvements Oakman Inns have made since taking over and rebranding. A warm glow greets you as you approach and the relaxed atmosphere is the first thing that strikes you on entry. This really is something of a retreat whether you are celebrating a special occasion or just popping in for a drink with friends and there was a great mix of age ranges from families having a birthday meal to couples young and mature. It smacks of an Oakman restaurant this. For those not familiar with the brand Oakman is the brainchild of restauranteur Peter Borg-Neal, an entrepeneuer from Tring who started his ever-growing group in his hometown with the Akeman. 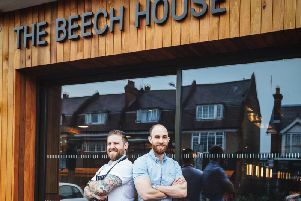 The Akeman Inn at Kingswood is now one of 17 venues across several counties and is actually run by Mr Borg-Neal’s son and general manager Eamonn. It says a lot about the Borg-Neals and Oakman that Eamonn has worked his way up the company to the position he now finds himself in and he looks a natural with nothing fazing him on a night where it is quite literally packed to the rafters - low beams are a great feature of this modernised old building. Staff are polite, fast and not intrusive but it’s the food that matters right? The fantastic wood-fired pizza oven dominates the main restaurant area and it takes an iron will to resist ordering something off that section of the menu. Like all Oakmans those doing the cooking are on full display - something that always appeals to me personally - and head chef Michal Dabrowski runs the show. Just as the setting is true to the Oakman benchmark, so too is the food. This is what I would call affordable fine dining. It will be a meal to remember without breaking the bank. There is plenty of choice for children and all angles are covered with a vegetarian haloumi burger a real winner. The main menu is a veritable feast for all tastes. From the handmade pizzas to sumptuous fillet steaks and slow roasted belly of pork (complete with the best crackling I’ve had in years). As a rule Oakman Inns pride themselves on serving fresh seasonal ingredients which is on show in the pumpkin ravioli which is garnished with sage, chilli butter, crushed hazelnuts and rocket, a real seasonal taste sensation. The pork belly is roasted for 12 hours in local ale and English mustard, finished on the Josper grill and served with mashed potato, apple puree, tenderstem broccoli, that crackling and gravy and there’s the added bonus that for every dish sold, Oakman donate 25p to The Woodland Trust. They aren’t one of these companies that is all talk and no action when it comes to “giving back to the local community” either. The Akeman Inn proudly sponsor nearby Westcott Cricket Club. It is also very much rejuvenated as a venue for the Vale too. I mentioned earlier Kate Winslet’s wedding there when it was the Crooked Billet. Well that is very much in focus at the Akeman Inn with weddings and parties - now serviced by a hugely extended car park - back on the menu in a big way. The fantastic tepees are truly eye-catching and will make for a memorable occasion. With Christmas looming large it would take some beating as a place to spend your day eating and celebrating if you opt to go out for dinner this December. The roaring open fire makes for a cosy setting with a selection of wines and the traditional Christmas dinner with all the trimmings on offer too. Eamonn and his team are doing a great job at the Akeman Inn, a pub-restaurant with bags of character and flavour to match which for a refreshing change is genuinely rooted in the local community. Oakman is the company which manages to make each venue feel like an independent and they have managed it yet again at the Akeman Inn at Kingswood.